WordPress is used by thousands of universities all over the world. Many universities run large parts of their web infrastructure with WordPress, and it’s time for them to have a niche WordPress conference catered for their experiences. Editor’s Note: Thus far, there have been numerous niche WordPress conferences aiming toward for-profit initiatives and geared toward businesses, marketers, or eCommerce site owners. But Rachel Carden‘s concept for a niche, education focused, non-profit event is unique and I’d love to see it happen. As she notes, universities have unique challenges for managing websites and are also great candidates for utilizing WordPress to its full potential. What follows is her pitch and public brainstorming session on what a higher education focused WordPress conference might look like. This all started with a tweet. WordCamp U.S. made a big announcement that was all over Twitter, Chris Lema tweeted what we were all thinking, and I couldn’t help but start daydreaming about the possibilities. You see, I’m a web designer and developer with a passion for all things WordPress, especially using WordPress to build the world of higher ed web. 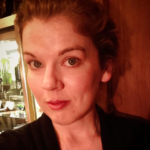 Having spent the last 8 years working in higher education, I’m always looking for ways to utilize the power of WordPress to fulfill my campus’s needs and to help its communication grow, whether it’s using the powerful CMS to stretch limited resources or using its new API capabilities to share information, and break down silos, across campus departments. I love attending WordCamps and other WordPress-related events, but the issues we generally encounter in higher ed are often overlooked. Much like online businesses or blogging, higher ed is a world of its own with unique challenges, content, stakeholders, and target audiences. In our world, we don’t worry so much about which eCommerce plugin is best. Instead, we’re more concerned with things like how to manage a large-scale network of faculty blogs, making sure we’re abiding with FERPA regulations, or wondering how to best implement single sign-on that integrates with Active Directory. The name “WordCampus” came to me from a tweet and does not, at this point, imply it would be an official WordCamp event. If needed, I’m open to organizing an event that is not affiliated with the WordPress Foundation. This is a detail that remains to be seen, but honestly, at this point, all details remain to be seen. A WordCamp representative has confirmed that a user group specific WordCamp is possible, but I would need to prove that it could draw a crowd. That’s why I need your help. 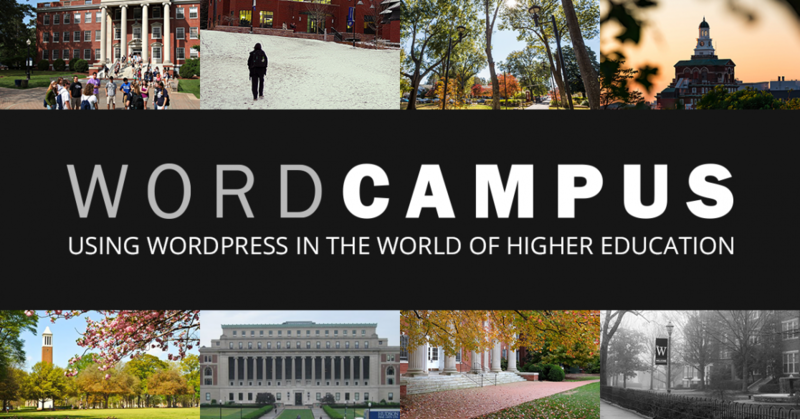 If a WordPress conference for higher ed is something you would be interested in (whether it’s as an attendee, speaker, planner, sponsor, or all of the above), I invite you to read a few of my thoughts, share yours in the comments, and visit wordcampus.org to show your support. Much like your usual WordCamp, the goal for this event is to keep the costs and ticket price as low as possible. The point of this event is professional development and community, not profit. The phrases “big budget” and “higher ed” don’t generally appear in the same sentence anyway. A lot of higher ed-oriented web conferences can run upwards of $500 so an inexpensive, but valuable, event would be attractive for most higher education web professionals. Having sponsors to help with costs would be crucial and I am open to all kinds of support, whether it’s monetary or in-kind. Sponsoring an event like WordCampus would be a unique way to get an organization’s name in front of one of the best communities outside of WordPress that uses WordPress all the time. In the world of higher education, you often have limited resources, so there are plenty of opportunities for third party products or services like hosting, themes, plugins, custom design, accessibility consulting, and custom development, among others. The location could be a sticking point, as high travel costs might be a deal breaker for many WordCampus attendees. The beauty of local WordCamps is that they are tied to a geographical region and therefore, for most attendees, have limited travel requirements. This could be a problem for an event that is not tied to a specific region. Venue wise, universities have beautiful facilities, so I’d love to host the event on an actual college campus and, if the hosting university could donate the space in kind, this would be a huge cost saver. The most preferable universities would also be located near a major airport to help reduce travel time. If I’m really dreaming big, it would be great to find numerous universities that would be willing to host and, therefore, we could have regional WordCampus events spread across the country. I don’t think this is outside the realm of possibility, but would depend on interest and attendance. I’m certainly interested in hearing from anyone that may be interested in hosting WordCampus at their university. There are a wide variety of WordPress users in higher ed, from the university-level WordPress developers and administrators, to the users who run WordPress for a college, to the faculty members using WordPress as a learning tool, and any students who’d love to learn a thing or two (they are our future, you know). That’s not even including content strategists, designers, social media managers, and more. WordCampus has the potential to attract a variety of users who could inspire a multitude of topics and professional development. Speaking of topics, these could also run the gamut from higher ed marketing and content strategy to infrastructure, managing multi-author blogs, and streamlining application processes. Accessibility should also be a featured topic as federally funded institutions are required by law to make their electronic and information technology accessible to people with disabilities. Personally, I see the structure of higher ed as tailor-made for the open source mindset and would love to hear someone encourage collaboration and openness by comparing the ideologies of open source with the inner workings of higher education. As organizing something of this magnitude takes time, I’m looking at a 2016 booking. What time of the year in 2016, however, remains to be seen. There are obviously a lot of variables at play, from venue availability to which time of the year is best for our target attendees. In higher ed, you need time to clear your schedule and request funding, so I’d want to allow for that. Usually, the middle of the semester is best for most higher ed professionals, but this can vary depending on their field. And if we’re being honest, the majority of fall might be out of the question because of football season. We’ve included a straw poll on the event landing page to help us gauge which time of year might be best for those interested in attending. Thank you for taking the time to read through my proposal and hopefully interested parties will have a few additional thoughts for the comments. If you would like be notified of any future developments, or show your support for the project, please visit wordcampus.org to share a little bit of information. And don’t forget to tell your friends! If you have any questions, or would like to chat, you can also find me on Twitter @bamadesigner. Count me in. If/when this happens, I’ll be glad to shop it around to my contacts in higher ed. Great job Rachel! I do hope it’ll get the attention you deserve. About a week ago, I was discussing a similar topic about how we can introduce WordPress in our Educational Eco-System. I think this is a great idea. +1. Did I hear accessibility consulting and WordPress in the same sentence? Of course I’m in. 🙂 Seriously, I think this is a great idea and, while I don’t have a lot of contacts in higher-ed, I’ll pass this on to the ones I do have. I am working on a “WordPress for Schools” startup that focuses on the K12 market. I’m very interested in contributing my knowledge and expertise on how WordPress solves problems for our public schools and how that can be applied to the Higher Ed market. This is the coolest idea I have heard in a long time. I know it will take some serious planning, but I also have a gut feeling that people will come out of the woodwork if you make it happen. I’m signed up for the list… let me know if there’s anything I can do to help! Great post and something I am really interested in helping with. I run WordPress for a University, and am one of the organizers of the local WordCamp. Just last week, I was talking and wondering about a higher-ed focused WordPress community, and today someone emailed me a link to this article. This really needs to happen. I love it when that happens! 🙂 Thanks for your support! This is a fantastic idea. Not only would we want to attend, but we would also be interested in sponsoring. LearnDash has a strong presence in higher education – it’s an area we are care about. I might suggest Boston as the ideal location for the first WordCampus as there would likely be an adequate supply of participants given that little fact. In any event, best of luck to you and your upcoming event. I think it’s going to be a hit! Interesting! Good to know. Thanks Ansel! Just registered our interest in both attending and helping sponsor this. We have a lot of contacts at schools throughout North America and I bet many of them could organize regional events. It would be seriously cool to coordinate something where a few were happening at the same time in different locations to cut down on travel costs and reach a large number of folks. Definitely keep us in the loop as discussion progress! You might want to reach out to the EdCamp people, who just scored a $2 million grant from the Gates Foundation to build out the EdCamps. There may be some kind of partnership possibility there. This looks great. I’ve been watching this percolate for a while, but haven’t yet commented. I work with WP part-time unrelated to higher ed, but also work part-time with the Public Knowledge Project, building tools for open access academic publishing on a non-WP (open source) platform. Do you see the conference overlapping with library tech, publishing and archiving in any way? Or is it mostly focused on the large networks many universities run for students, teachers and marketing? If it’s work being done in higher education, then yes. All are welcome. We’re also considering broadening our scope to all formal education, so basically K-12 to higher ed. If you’d like to get involved, and stay in the loop, visit http://wpcampus.org and share your info. We’d love to hear more about your work! Count me in. James Madison University (Harrisonburg, VA) set up WPMU in 2010. We now have over 500 WordPress sites and over 10,000 unique logins. We have integrated our installation with Active Directory and the Student Administrative system so that official class rosters can be synchronized with WP site membership. We use it for instruction and scholarship. Each site is different but almost all are tied to courses, many of which meet year after year to continue building the site. For us, WP is a platform for (i) publishing non-traditional scholarship (e.g. movies, oral histories, timelines, maps, podcasts, mashups and remixes, infographics, digital image exhibits, etc. ), for (ii) authoring multi-modal compositions, and for (iii) hosting digital humanities projects. We’d be interested. We’ve been building WP solutions for Harvard, Stanford, MIT among others. A note on the name. It is wonderful (WordCampus) but is too close to WordCamp US and will cause confusion. We are just starting also to collaborate with university IT guys to hook it up to their administrative applications (enrollment, library, human resources…). We were, so far, frustrated by the lack of interest of the education communities in wp but I am glad to discover this initiative. Thanks Rachel. We are interested by organizing a major international event around WP in Education in Marrakesh in spring 2017. Would love to attend such an event. We use WordPress at our higher ed institution here in Barcelona for faculty and student blogs. I’d love to see a gathering like this focus not just on the business applications of WordPress in higher ed (institutional websites, IT infrastructure, etc) but also on practical teaching and learning applications. For example, it would be awesome if attendees could collaborate on a list of themes and plugins that work really well under typical educational models. I’ve filled out the form and look forward to seeing what you come up with! I am most definitely IN. As I mentioned back in my post in early August, https://malartu.org/2015/08/is-a-wordcamp-higher-ed-or-word-campus-possible/ , Malartu Inc is also very interested. One of my biggest concerns, though, is the making it truly accessible and interesting to faculty. That’s actually been one of the problems with most WordCamps – not only do WordCamps tend to be commerical website-oriented, many of them are not very accessible to faculty/students for teaching and learning applications. We need a place where all the “Teaching with WP” and “Domain of One’s Own” and Connected Course folks can come together.